Rolling resistance has become one of several key factors to both consumers and racers when making their tyre decision, especially in the bicycle market. Tire efficiency has become a key marketing point and will continue to advance as new technology enters the market place. Whether it's road or MTB riding, a tyre with lower rolling resistance often provides a better quality ride, soaking up small obstructions and not transferring them directly to the bicycle and rider in addition to reducing the effort to move forward. A smoother ride, faster speeds and more efficient handling are the results. As fuel prices go up and electric vehicles gain popularity, owners will demand the best efficiency possible helping to save on battery output and life span. Combustion engines can achieve similar benefits from lower rolling resistance tyres. Stretching fuel mileage can result in substantial cost savings each year. 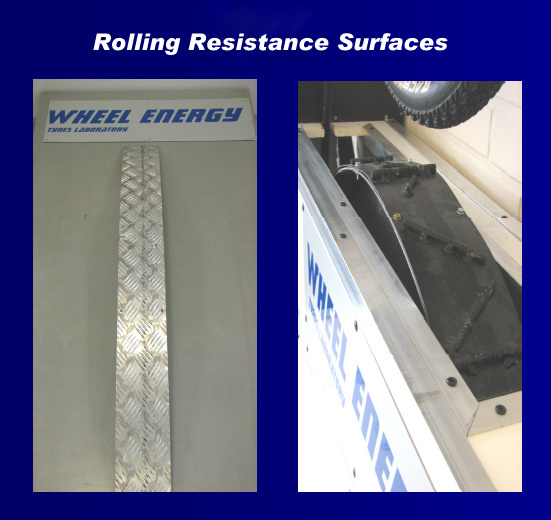 Wheel Energy tests provide detailed information and repeatable lab results to assist each clients needs. The laboratory allows for consistency in the results with no variables in weather condition, rider input or vehicle differences. Whether for product development testing, competitor comparison or race team testing, Wheel Energy Labs can provide documented and consistent results to help reduce the learning curve and development timelines.